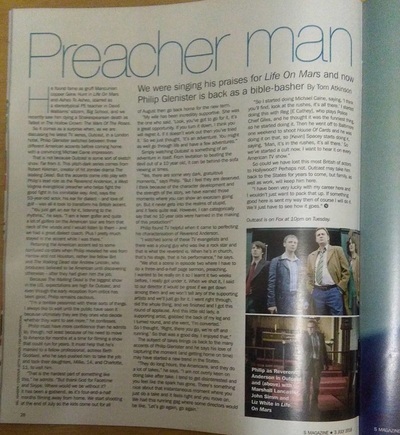 We were singing his praises for Life On Mars and now Philip Glenister is back as a bible-basher. He found fame as gruff Mancunian copper Gene Hunt in Life On Mars and Ashes To Ashes, starred as a stereotypical PE teacher in David Walliams’ sitcom, Big School, and we recently saw him dying a Shakespearean death as Talbot in The Hollow Crown: The Wars Of The Roses. 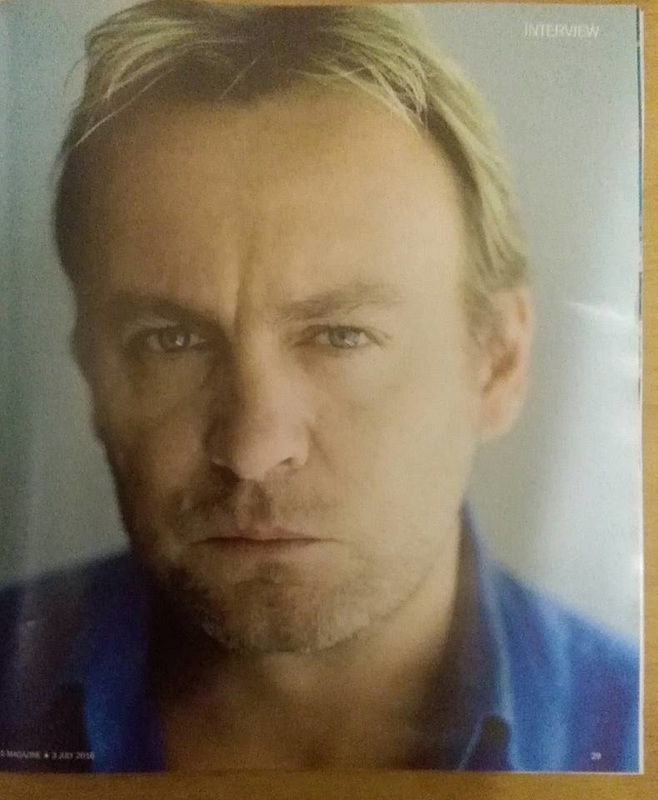 So it comes as a surprise when, as we are discussing his latest TV series, Outcast, in a London hotel, Philip Glenister switches between three different American accents before coming home with a convincing Michael Caine impression. That is not because Outcast is some sort of sketch show. Far from it. This pitch-dark series comes from Robert Kirkman, creator of hit zombie drama The Walking Dead. 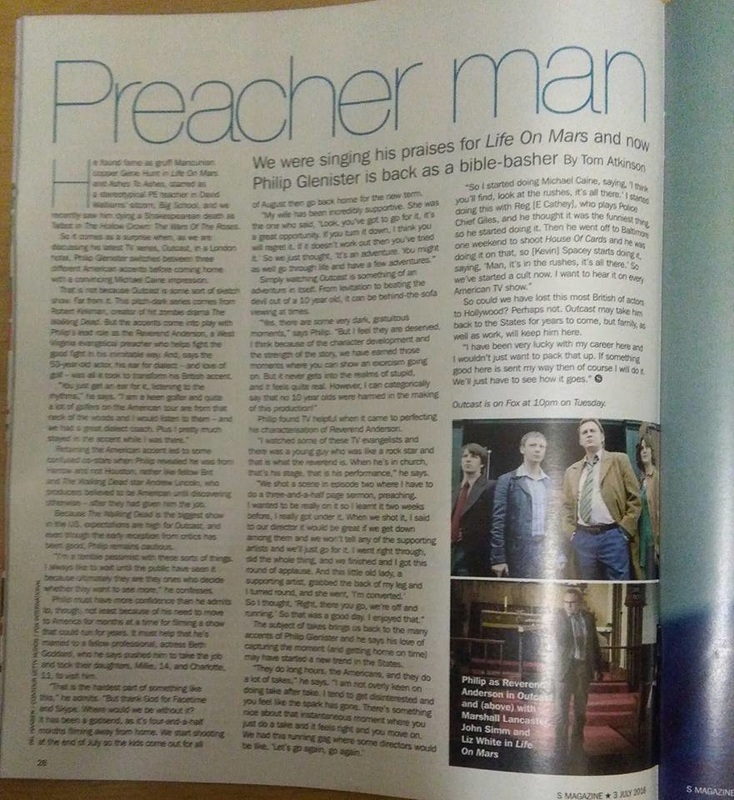 But the accents come into play with Philip’s lead role as the Reverend Anderson, a West Virginia evangelical preacher who helps fight the good fight in his inimitable way. And, says the 53-year-old actor, his ear for dialect – and love of golf – was all it took to transform his British accent. Retaining the American accent led to some confused co-stars when Philip revealed he was from Harrow and not Houston, rather like fellow Brit and The Walking Dead star Andrew Lincoln, who producers believed to be American until discovering otherwise – after they had given him the job. Because The Walking Dead is the biggest show in the US, expectations are high for Outcast, and even though the early reception from critics has been good, Philip remains cautious. “I’m a terrible pessimist with these sorts of things. I always like to wait until the public have seen it because ultimately they are they ones who decide whether they want to see more,” he confesses. Philip must have more confidence than he admits to, though, not least because of his need to move to America for months at a time for filming a show that could run for years. It must help that he’s married to a fellow professional, actress Beth Goddard, who he says pushed him to take the job and took their daughters, Millie, 14, and Charlotte, 11, to visit him. “That is the hardest part of something like this,” he admits. “But thank God for Facetime and Skype. Where would we be without it? It has been a godsend, as it’s four-and-a-half months filming away from home. We start shooting at the end of July so the kids come out for all of August then go back home for the new term. Simply watching Outcast is something of an adventure in itself. From levitation to beating the devil out of a 10 year old, it can be behind-the-sofa viewing at times. “Yes, there are some very dark, gratuitous moments,” says Philip. “But I feel they are deserved. I think because of the character development and the strength of the story, we have earned those moments where you can show an exorcism going on. Philip found TV helpful when it came to perfecting his characterisation of Reverend Anderson. The subject of takes brings us back to the many accents of Philip Glenister and he says his love of capturing the moment (and getting home on time) may have started a new trend in the States.